How do you build equity in a home? It’s true that your home builds equity over time. As your neighborhood or area improves, so does your home’s value. The economy, crime statistics, community improvements & employment rates; these are just some of the factors that affect your home’s value. The two most obvious ways to build equity are to pay down your principle balance and make home improvements. Paying your principle balance down is a highly effective way to build equity. As you make payments on your mortgage, or home loan, a portion of your payment goes towards the interest you accrue and a portion goes toward your principle balance. Over time, you could become a good candidate for refinancing your loan. A lower principle balance and better interest rates will certainly save you money! 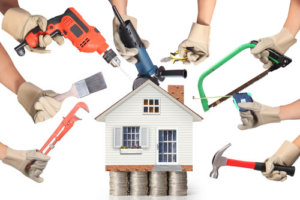 Making home improvements is a great way to increase your home’s value! Minor improvements such as, painting, installing a kitchen back-splash or hanging new window treatments make your home more aesthetically appealing to consumers. If your home is more aesthetically appealing, consumers may be willing to pay more. Installing a new furnace, windows or roof are major improvements that are costly, but the return can be significant as these improvements will increase your home’s value. Investing in your home, no matter how little, is a good decision. When a Real Estate Broker completes a valuation on your home, they should ask you what improvements you’ve made to your home. No matter how small the improvement, be sure to share this information with your Broker. You might be surprised at your new valuation!